"This is a sweet fruit salad intended to be served as a low-fat dessert. The syrup is essential; without it, you just have an ordinary fruit salad, for which you probably don't need a recipe! You can vary the fruits to use what you have on hand. This is especially good with strawberries and melon. Bananas might be too overpowering, though." Place the sugar, water, lemon zest, cinnamon, and 2 tablespoons of lemon juice into a small saucepan. Bring to a boil; reduce heat to medium-low and simmer 10 minutes. Strain the syrup through a mesh strainer; refrigerate until cold. 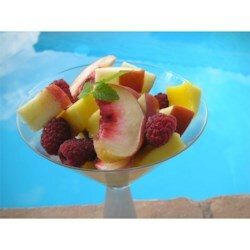 Place the mango, peaches, apple, raspberries, mint, and 2 tablespoons of lemon juice into a mixing bowl. Pour the chilled syrup overtop and gently stir to combine. Word up -- I used 1/4 c sugar + 1/4 c honey instead of the full c sugar, plus I substituted blueberries for some raspberries. It was very tasty! Lovely. The lemon simple syrup is a delicious enhancement to these beautiful summer fruits. Thanks for sharing! Wonderful way to flavor simple syrup! Now I want to try lemon and mint, lemon and ginger, lemon, ginger and mint, orange and cinnamon...endless possibilities!